You can compensate for the shortcomings of a CIC decimator, namely its passband droop and wide transition region, by following it with a compensation decimator. This System object™ lets you design and use such a filter. Create the dsp.CICCompensationDecimator object and set its properties. ciccompdec = dsp.CICCompensationDecimator returns a System object, ciccompdec, that applies an FIR decimator to each channel of an input signal. Using the properties of the object, the decimation filter can be designed to compensate for a preceding CIC filter. ciccompdec = dsp.CICCompensationDecimator(decim) returns a CIC compensation decimator System object, with the DecimationFactor property set to decim. ciccompdec = dsp.CICCompensationDecimator(cic) returns a CIC compensation decimator System object, with the CICRateChangeFactor, CICNumSections, and CICDifferentialDelay properties specified in the dsp.CICDecimator System object, cic. ciccompdec = dsp.CICCompensationDecimator(cic,decim) returns a CIC compensation decimator System object, ciccompdec, with the CICRateChangeFactor, CICNumSections, and CICDifferentialDelay properties specified in the dsp.CICDecimator System object cic, and the DecimationFactor property set to decim. ciccompdec = dsp.CICCompensationDecimator(___,Name,Value) returns a CIC compensation decimator object with each specified property set to the specified value. Enclose each property name in quotes. You can use this syntax with any previous input argument combinations. Specify the differential delay of the CIC filter being compensated as a positive integer scalar. Specify the number of sections of the CIC filter being compensated as a positive integer scalar. Specify the rate-change factor of the CIC filter being compensated as a positive integer scalar. Specify the decimation factor of the compensator System object as a positive integer scalar. Specify whether to design a filter of minimum order or a filter of specified order as a logical scalar. The default is true, which corresponds to a filter of minimum order. Specify the order of the decimation compensator filter as a positive integer scalar. This property applies only when you set the DesignForMinimumOrder property to false. Specify the passband edge frequency as a positive real scalar expressed in hertz. PassbandFrequency must be less than Fs/2, where Fs is the input sample rate. 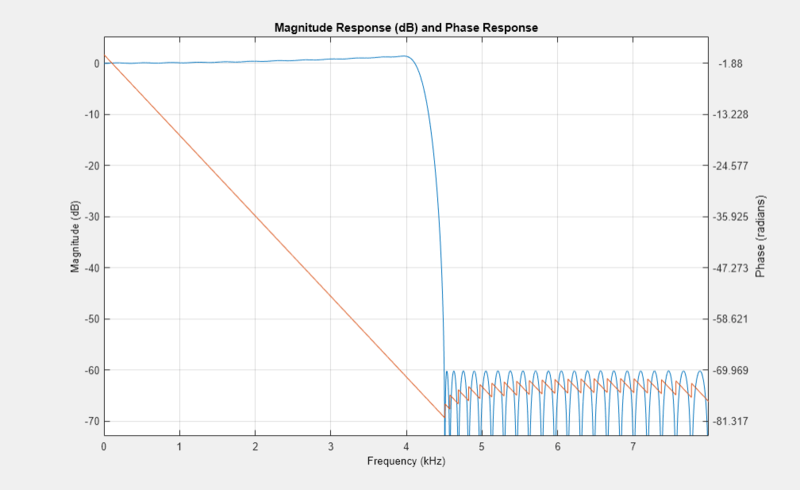 Specify the filter passband ripple as a positive real scalar expressed in decibels. Specify the input sample rate as a positive real scalar expressed in hertz. Specify the filter stopband attenuation as a positive real scalar expressed in decibels. Specify the stopband edge frequency as a positive real scalar expressed in hertz. StopbandFrequency must be less than Fs/2, where Fs is the input sample rate. y = ciccompdecim(x) returns the filtered and downsampled values, y, of the input signal, x. Data input, specified as a vector or a matrix. The System object treats a Ki × N input matrix as N independent channels, decimating each channel over the first dimension. This object does not support complex unsigned fixed-point data. Filtered and downsampled signal, returned as a vector or matrix. For a Ki × N input matrix, the result is a Ko × N output matrix, where Ko = Ki / M and M is the decimation factor. Design an CIC compensation decimator. Specify the decimation factor to be 2, passband frequency to be 4 kHz, stopband frequency to be 4.5 kHz, and the input sample rate to be 16 kHz. 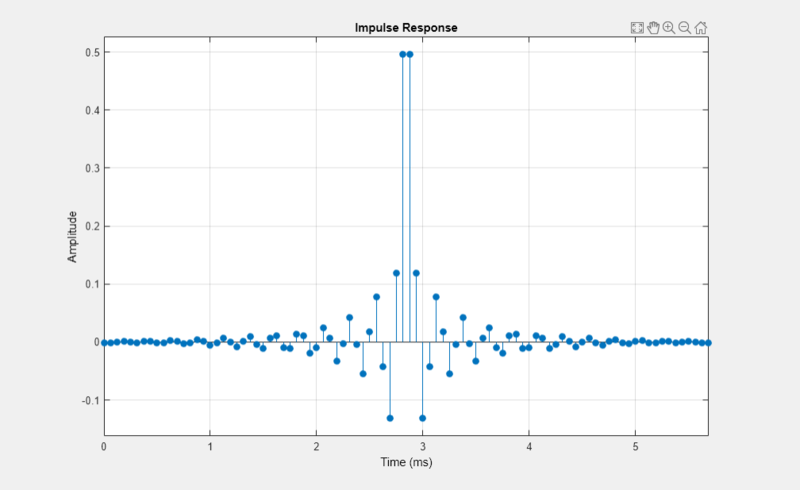 Plot the impulse response. The group delay of the filter is 45.5. Design a compensation decimator for an existing CIC decimator having six sections and a decimation factor of 6. Construct the compensation decimator. Specify a decimation factor of 2, an input sample rate of 16 kHz, a passband frequency of 4 kHz, and a stopband frequency of 4.5 kHz. Visualize the frequency response of the cascade. 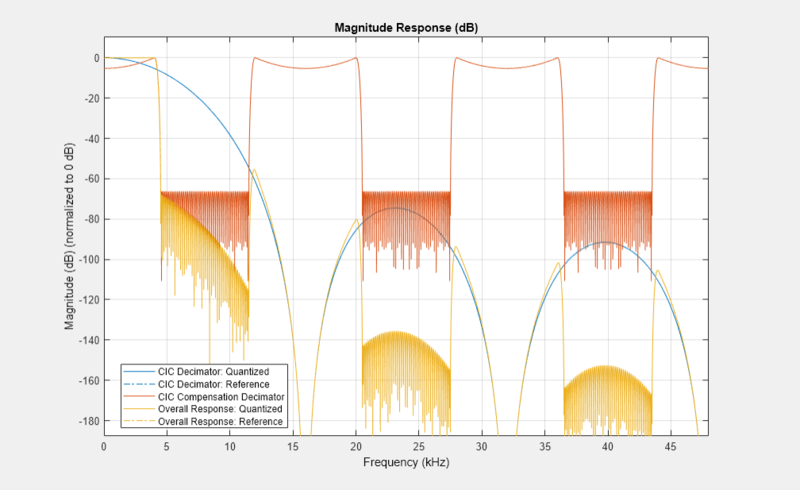 Normalize all magnitude responses to 0 dB. Apply the design to a 1200-sample random input signal. Store the decimated output along the first dimension of the y array. R, D, and N are the rate change factor, the differential delay, and the number of sections of the CIC filter, respectively. where ωp is the passband frequency of the CIC compensation filter. This previous equation is the inverse sinc approximation to the true inverse passband response of the CIC filter.